We are the new breed of dog trainers. Our classes meet in the basement of St Paul and the Redeemer, 4945 S Dorchester in Hyde Park (Chicago). Jane Masterson has been training and walking dogs for nearly fifteen years. She began as an assistant, but the traditional style teaching she encountered (i.e. jerks on a choke chain) prompted her to begin working, in 2002, at Call of the Wild School for Dogs. 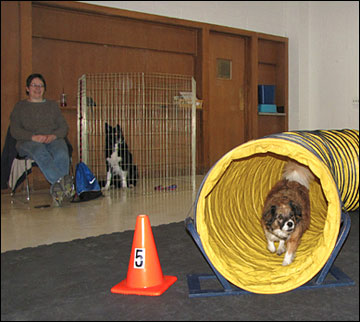 She continued working there until 2004 (first in daycare, later in training). It was here she encountered Chris Bach's "The Third Way" method, which she loves and still uses in her training today. She also draws on the work of Turid Rugaas, Sue Ailsby, Pamela Dennison, Ian Dunbar, Leslie Nelson and Suzanne Clothier in her classes and private lessons. She decided to switch to full-time dog training after discussing with her NatSci 105 students in the fall of 2004 how lucky Irene Pepperberg was because she got to work with animals all day long! Jane's home life is currently enriched by one dog, three cats and five birds. Jane also leads nature walks at Jackson Park (see passitonchicago.com) and loves to read, explore, and travel. 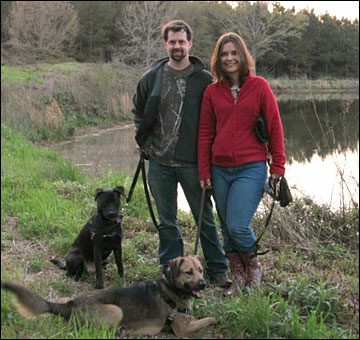 Britni’s canine and teaching expertise comes from both personal experiences and professional training. She took a crash course in the joys and challenges of puppy-hood when she raised a litter of nine puppies birthed by her foster dog. Since then, her ongoing education has been enhanced by the permanent adoption of the mother dog and one of her puppies. She has participated in Agility and K9 Nose Work® classes with both of her dogs, with the recent honor of earning a Nose Work 2 (NW2) title. When she is able, she enjoys volunteering at local Chicago area shelters. Britni’s formal canine education includes the completion of a comprehensive Canine Behavior and Training program from CanineLink Academy and she is a Certified Nose Work instructor (CNWI) through the National Association of Canine Scent Work, NACSW. As enthusiastic of a student as she is a teacher, Britni attends many seminars and workshops all over the country to deepen her understanding about canine behavior and stay abreast of new research and practices. Britni has years of experience helping people master new and challenging subject matter. She is a Chemistry instructor at the University of Chicago, where she earned her PhD., and is an honored recipient of many student-nominated teaching awards. Regardless of the subject being taught, she enjoys helping others learn the tools needed to take on the challenges before them.